Arnold SCHÖNBERG: Pierrot lunaire, Op. 21 (1912) with jazz interludes by Maria BAPTIST. Luciano BERIO: Folk Songs (1964). 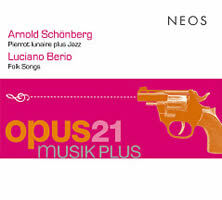 Stella Doufexis (voice, mezz sop), Maria Baptist (pno), opus21musikplus: Bruno Jouard (fl), Dörte Sehrer (clars), Lisa Schatzmann (vln), Nils Mönkemeyer (vla), Benjamin Santora (vlc), Helen Radice (hp), Philipp Jungk, Alex Glöggler (perc), Konstantia Gourzi (cond.). Neos 10709 (http://www.neos-music.com/). Distributed in the US by Qualiton (http://www.qualiton.com/). 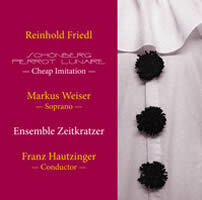 Reinhold FRIEDL: Schönberg Pierrot Lunaire Cheap Imitation. Markus Weiser (sop), Ensemble Zeitkratzer: Burkhard Schlothauer (vln), Anton Lukoszevieze (vlc), Ulrich Phillipp (cbs), Reinhold Friedl (pno), Maurice de Martin (perc), Hayden Chisholm, Frank Gratkowski (perc), Franz Hautzinger (cond.). zeitkratzer Records zkr 001 (http://www.zeitkratzer.de/). It’s turning out to be a year of confessions. As important as the thrice-seven poems of Op. 21 have been to my musical development, I can no longer sit still through Pierrot lunaire. They say that you’ll never eat sausage again once you see how it’s made. Analyzing Pierrot comes to a full tour of the hotdog factory. I squirm because Pierrot has spawned so many pale imitations. A victim of its own success, its vocabulary has become passé. Everyone wants to try his hand at Sprechstimme. Perhaps Stravinsky’s L’Histoire, Boulez’s Marteau, Davies’ Eight Songs were inspired by other things, and yet I can’t help thinking they had Schoenberg in their sights. So many have employed the five-strong instrumental combination that the “Pierrot ensemble” has become a standard configuration. That said, I welcome almost anything that encourages a fresh Pierrot listen. Opus21musikplus permits pianist Baptist to improvise between parts. We step from Schoenberg’s fussy, neurotic world into tentative jazz. Baptist’s improvisations perch between Berg and Monk, recalling what preceded and hinting at what will follow. I was initially skeptical. While these interruptions are bound to infuriate purists, they do refresh. Gourzi leads a well-balanced performance with crisp details. Doufexis’ confident Sprechstimme offers clarity without going over the top. Berio’s Folk Songs get so fine a reading, I did not crave Berberian’s rendition as I had after hearing this. Zeitkratzer reduces Pierrot to a tasty snack. The Faithful will disapprove, and not only because the confection’s title dares to rope in Cage. It’s obvious that Friedl’s handling nicely parodies the original 21 movements, capturing their contours and mood. Except for the last, each poem expires in under a minute while requiring more players than Schoenberg’s original quintet. Weiser’s amplified falsetto suggests what Pierrot would be like if Klaus Nomi took a shot at it. Zeitkratzer reminds us of Pierrot’s history. Schoenberg was apparently wary of providing a piano reduction, explaining “tone-color means everything, the notes nothing.” There is the well-known story: During a rehearsal before the premiere, clarinetist Karl Essberger played one movement on a B-flat clarinet instead of an A clarinet (a semitone off) and the composer did not notice. Pierrot does have several built-in contradictions. The Valse de Chopin that doesn’t sound like Chopin, and when Pierrot plays his viola, we hear a cello. I wouldn’t dare play it to trick someone, but you might. Among other indications that Pierrot has become sonic wallpaper, the soundtrack for the movie (Untitled) (Cantaloupe CA21050) scatters amidst David Lang’s “real” music bits of Chopin and Grieg and Pierrot shards. The haphazardly rendered Schoenberg reveals an intent.